There's been increasing chatter in the rumor mill about the possibility of a smaller 7.85" iPad that could be introduced sometime in 2012. The rationale behind the smaller form factor is for Apple to better compete against the new 7" Kindle Fire tablet from Amazon. Amazon's new Kindle line seems to be an early success with over 3 million sold over the first three weeks. Amazon doesn't break down the numbers for individual models but calls out the Fire as "the most successful product we've ever launched". Apple's never been one to try to compete spec for spec against their competitors. The iPhone, for example, has kept the same basic form factor across 5 different generations, despite a proliferation of different sizes amongst its competitors. While we're not sure what makes a smaller iPad different, we've heard it frequently enough that we believe Apple is in late prototyping phases for such a device. The supply chain has actually been very specific about the screen size of this rumored iPad. 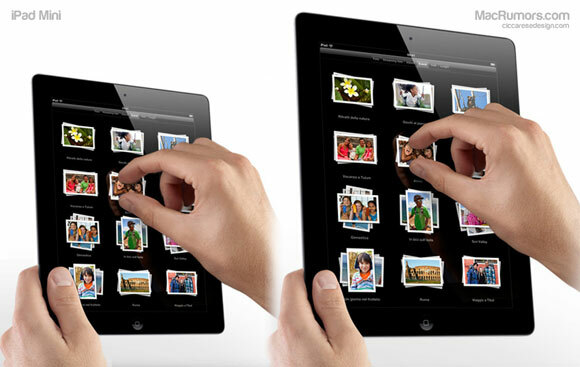 According to Chinese manufacturers, Apple is buying up 7.85" screens for this upcoming mini iPad. So, we asked our friends at CiccareseDesign to put together these mockups of what a 7.85" iPad would look like in comparison to the existing 9.7" iPad. They also created this "actual size" PDF that can be printed out so you can play with one yourself in real life. Simply print the PDF at 100% size on your printer, and you too can see what a 7.85" iPad feels like in hand. If you don't have a printer handy, you can view it in actual size in an iPad web browser. If you save it as a web icon on your home screen, it will then launch without a menu bar so you can fully appreciate the size. The 7.85" iPad actually feels a lot smaller than the existing iPad. The user interface elements, however, don't feel that far out of place. 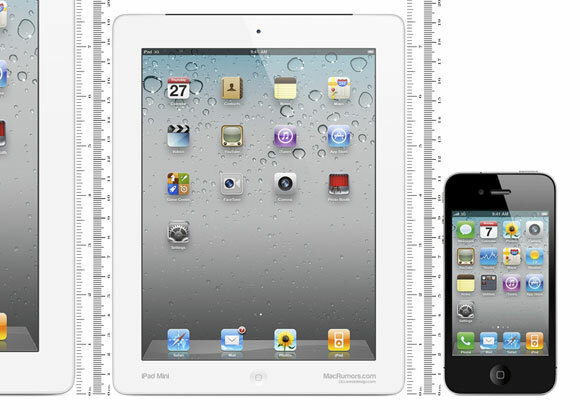 Icons are smaller than the 9.7" iPad, of course, but still bigger than the icons found on the iPhone. The on screen keyboard also seems quite usable at this size. Other elements, such as Safari's location bar, do scale down but, again, are no smaller than what we've seen on the iPhone. We're not not making a 7-inch tablet because we don't want to hit a lower price point. We just believe it's too small to hit the user experience people want. When we make decisions, it's not about cost, it's about value when you factor in the software. We're all about the best products at aggressive prices. So, based on that stance, it might seem unlikely that Apple would produce such a device, but they've been known to change their mind before. Geez. A 7.85" iPad is a horrible idea. I'd much rather have a 7.85" iPod. MR, I'm glad you learned how to hold shift in photoshop to scale something proportionally. No doubt Google will copy the hell out of whatever will do anyway, so might as well mock up an Andriod look alike. First - google makes software not hardware. Second - there are already 7" tablets that run Android. So I think you have that COMPLETELY backwards buddy. Jobs also said that no one reads books any more and then proceeded to open up the iBookstore. "The rationale behind the smaller form factor is for Apple to better compete against the new 7" Kindle Fire tablet from Amazon." and here we see why there is zero credibility to this story. apple doesn't make things to go into an existing market just to compete. you should know that by now. apple doesn't give a **** about what amazon is selling, as long as what amazon is selling isn't infringing on their copyrights. end of story. No doubt Google will copy the hell out of whatever will do anyway, so might as well mock up an Andriod look alike." I pointed out you were wrong. That Google doesn't make hardware and that there are already 7" But you keep trying to change the subject instead of just admitting that you made a mistake. It's cool though. It's there in black and white for everyone to see anyway. I see... So there were decent Android tablets before the iPad? That's because Apple released a great one and everyone else copied, Google rushed out a tweeked version of <Insert stupid OS name here> and that was that. You keep confusing OSes and Hardware. You said that Google would be copying Apple if they made a 7" tablet meanwhile Android is already ON 7" tablets. Keep flame baiting though - it's going to get MacRumors a nice holiday bonus check from its advertisers for the added clicks..
Why do you keep going on about hardware and software? are you confused? For the last time. Sincerely - because you're obviously suffering from the inability to read your own posts. "No doubt Google will copy the hell out of whatever will do anyway, so might as well mock up an Andriod look alike." Google will copy what? A 7" tablet? As I said - they don't make hardware. 7" Tablets running Android already exist. So how (even IF Google made hardware) would Google be copying Apple who if/when they made a 7" tablet if the Apple 7" came after? The person confused is not me, sir. Tis you. Not going to argue/discuss this point with you further since you obviously don't get it. Compete against a device that they've already far outclassed? We don't even know how many of these Amazon actually sold and what % share they have. The Kindle Fire has been a massive disappointment. I wonder if Apple will sue Samsung for making a 7" tablet?